Dan's Movie Report: Cannibals And Carpet Fitters (2017) A Dan's Movie Report Worldwide Exclusive! Cannibals And Carpet Fitters (2017) A Dan's Movie Report Worldwide Exclusive! Greetings valued readers of Dan's Movie Report, 'Cannibals And Carpet Fitters' recently had its Worldwide cast and crew screening and of course, Dan's Movie Report was on hand to witness this special occasion. Being that this is a very preliminary review, there will be no spoilers, AT ALL, given. Just a general synopsis and my overall thoughts. Special thanks to producer James Bushe for this inside look at his masterpiece in pieces of flesh, and of course there is no peace for the victims! Basically, the title describes the movie perfectly. An independent business of Carpet Fitters (Installers in the USA) are sent to a particular house to do a huge job. In that house resides a family of shall we say unique and unsavory characters, which have appetites for particularly delicate food. Being a genre mix of comedy, horror, and action, CaCF which I shall call the film presents a monumental achievement in merging the genres. There are horrible scenes, exciting scenes, action scenes, and some really hysterical comedy. Director James Bushe really made a spectacular film. I laughed out loud, in some scenes and in other scenes I was on the edge of my seat with fear. There is of course copious blood and gore, and definitely not suitable for children under 17, that said those adults with the mentality of kids ha, like me ,enjoy the hell out of it! How is this possible you ask? James and his talented DP, were able to correctly light all the scenes and film with proper angles to show the action, when action was needed, the horror, when horror was needed, and up close and clear dialogue when comedy is needed. That is the problem with many films trying to merge the genres, some areas shine and others are tinged so dark the audience has no idea what the hell is going on. The entire cast is amazing, special kudos go to the incredible Zara Phythian, for enduring a destroyed knee, showing up on crutches, courtesy of a previous production, but in true film fashion it is incorporated into the film with spectacular and piercing results! Lee Charles provides some real muscle and craziness as well. Big scary man doing big scary things hah! I mean I can go down the list as the cast was well rehearsed in action, comedy, and horror, obviously passionate about all three willing to go that extra mile for the perfect indie film. Special kudos go to sound design team for knocking it out of the park with tense music when needed complete silence and clear dialogue when needed.. Again a pet peeve of mine, if you cannot hear the actors speak, boom how the hell do you know what is going on! The film will be making its festival run this Halloween season and in my opinion: Fly, walk, drive, or crawl over broken glass to see it! 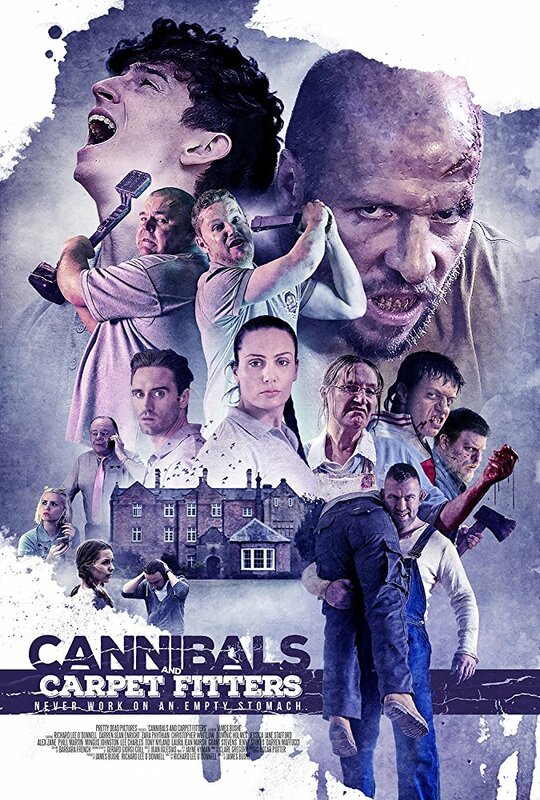 'Cannibals and Carpet Fitters' rates a damn near perfect 9 out of 10, a must own and see! If you disagree with my review, great we all have opinions, just remember, where you read the first review! This is my top pick indie film for 2017! Boom, I am getting hungry! Keep reading Dan's Movie Report for more exclusives and contests throughout 2017 and 2018!